Playing with the proper intensity is important to play your best hockey. Your intensity might not always be consistent. Some games, you might be psyched up and ready to play while other times, you might lack interest or feel bored, which hurts your ability to concentrate. When your intensity isn’t consistent, your play is not consistent either. When your level of intensity is high, you’ll perform your best. But when not focused, you might look like a totally different player struggling to perform the same way you’ve performed in the past. When you lose intensity, it’s harder to focus your best. Without full focus on the task, you can’t execute or perform to the best of your ability. A lack of intensity can lead to mental errors such forgetting the play or losing the puck in your own end. Mental errors can cause momentum shifts too. Many players and teams can lose intensity and thus focus during the game. You might lose focus because you’re bored, such as playing a weaker team. The key is to give yourself a challenge. For example you might challenge yourself to make crisp passes or have two more shots on goal. Your pregame routine is a perfect time to boost your intensity. What’s your optimal level of intensity? Do you play your best when you’re relaxed or do you need to psych yourself up? Once you know your optimal level of intensity, then you can try to establish that mindset before competition. Your pregame preparation is key to maintain your intensity. Not only do you need to warm-up physically, but also mentally. You want to get in the right frame of mind and emotional state before competition. Listening to music is one way to do this. If you need to increase your intensity, listen to fast, upbeat music. If you need to decrease your anxiety, listening to slower paced music might be more helpful to you. 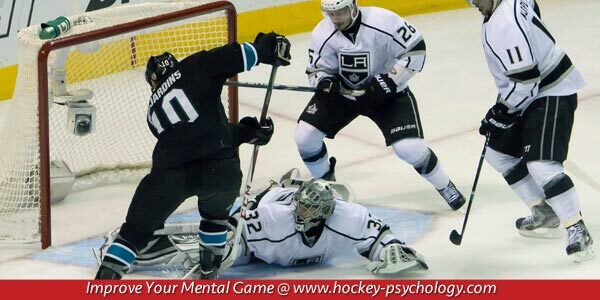 Your hockey psychology tip for today is to monitor your pregame level of intensity. Take the necessary steps to boost your intensity prior to the game. Get your heart rate up before the game. Challenge yourself to play well and set small goals to go after. Don’t play to the level of the competition if the opposition is weaker.